In July 2019, Paris will host the 5th World Journalism Education Congress. 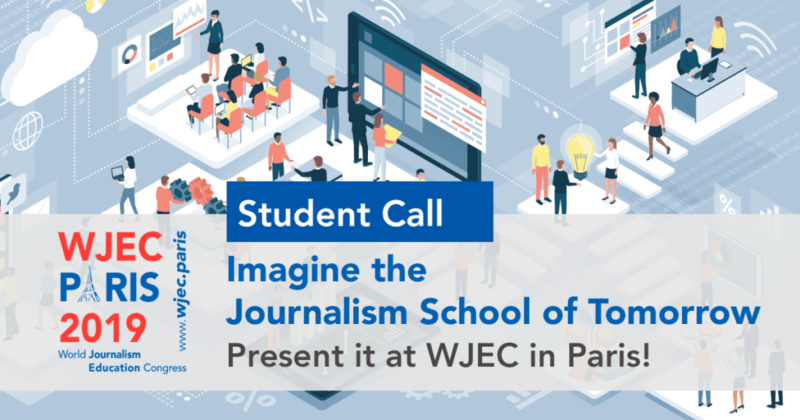 To celebrate this event, five students will be invited to WJEC to share their innovative ideas about the future of journalism education. Their projects will be presented live with the keynote speaker François TADDEI. Journalism schools are the windows of the profession tomorrow. Despite facing unprecedent upheavals they are not only adapting their courses and programs but also preparing future journalists. Beside presenting the views and ideas of professionals, WJEC also wishes to cater for journalism students. 5 projects will be selected and presented by the students themselves, during the “Innovation Keynote” on Friday 11th July 2019. This keynote will be chaired by François TADDEI, the Director of the Center for Research and Interdisciplinarity of the Université Paris Descartes. The best contributions will be thereafter published by the WJEC. Students whose projects have been retained, will be invited to attend the Congress in Paris from July 8th to July 11th. All travel expenses, congress fees, flights and accommodation will be settled by the WJEC. To take part, the students must answer the survey: click-here. Please note: only journalism students can participate. All participations/presentations must be in English. A short biography (studies, interests, publication, etc). The winners will be notified two weeks after the deadline, May 15th 2019. Further information and comments: contact@wjec.paris.